The new 2019 Toyota Camry is always sporting something wonderful. Visit our dealership in Lilburn, Georgia and experience the new Camry with its front grille and sporty mesh design! The Camry offers plenty of innovative 2.5L 4-cylinder engine, and improved V6 engine options make it easy for every type of driver to get what they want. The Camry also comes through for Georgia drivers with the 8" multimedia touch-screen and a 10" color Head-Up Display. 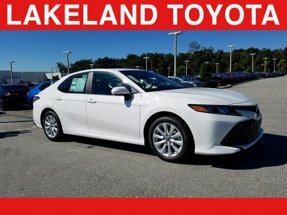 Finance a new Camry near Atlanta, Georgia today! The all-new Camry offers an independent MacPherson strut front suspension, a new direct shift 8-speed automatic transmission with a 3-mode drive select, and more! The Camry L bests the Accord and Altima with an EPA estimated 41-mpg on the highway and with 203-hp. There is no comparing a vehicle that offers a no-cost maintenance plan with its purchase. Contact our experts at Stone Mountain Toyota today and learn more.